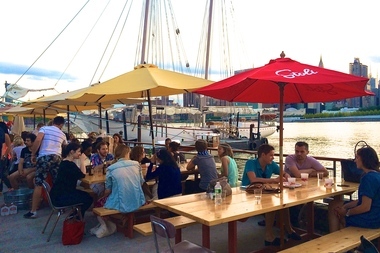 Anable Basin Sailing Bar & Grill sits along the East River in Long Island City. It's summer in the city, which means late sunsets, sticky weather and shorter work weeks for the lucky ones among us. All of these factors make for ideal circumstances under which to spend evenings on the waterfront sipping the beer, wine or cocktail of your choice. 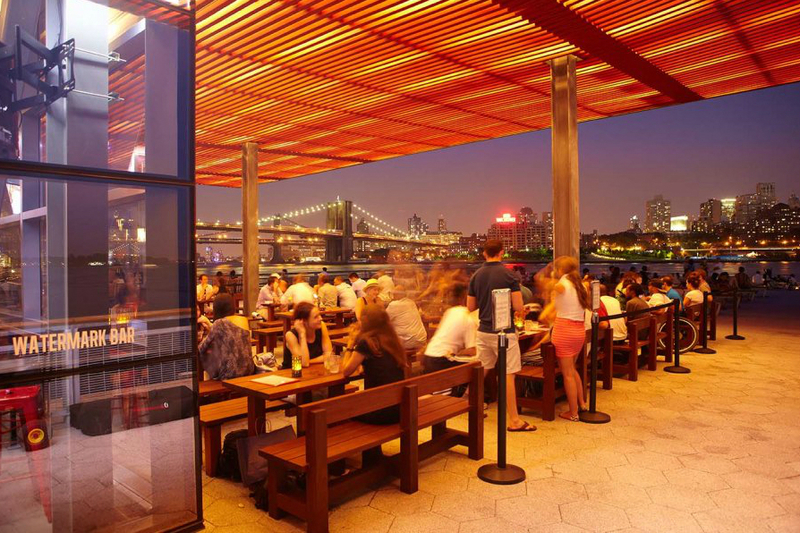 Here are some of the city's finest waterfront drinking establishments. Enjoy! This bar in the middle of the Beach 97th Street concessions offers a place to drink beers and micheladas right on Rockaway Beach and has live music and DJs most weekends. It offers beer specials (four Lionshead cans for $10), wine and micheladas and is surrounded by delicious food concessions including Uma's and Breezy's BBQ. Take a seat at one of the benches on the boardwalk with some cans (don't forget a $1 Low Tide coozie) and watch the majestic Atlantic Ocean in front of you. Drink out of a frozen pineapple at Bungalow Bar, which offers sunset views from its large back deck. You can order from the restaurant's menu or just drink from the back bar, which has a fully stocked liquor shelf in addition to frozen drinks and "the coldest beer in Queens." Try this nautical-themed bar on the Hudson River with good food from the guys behind Freemans and the Spotted Pig. Take advantage of the 50-cent pool table, free jukebox, cheap beer and somewhat pricey specialty cocktails. It's ideal for day-drinking, but you could also try out "shipwrecked karaoke" on Tuesdays at 9 p.m., with 2-for-1 Busch pints and well cocktails. 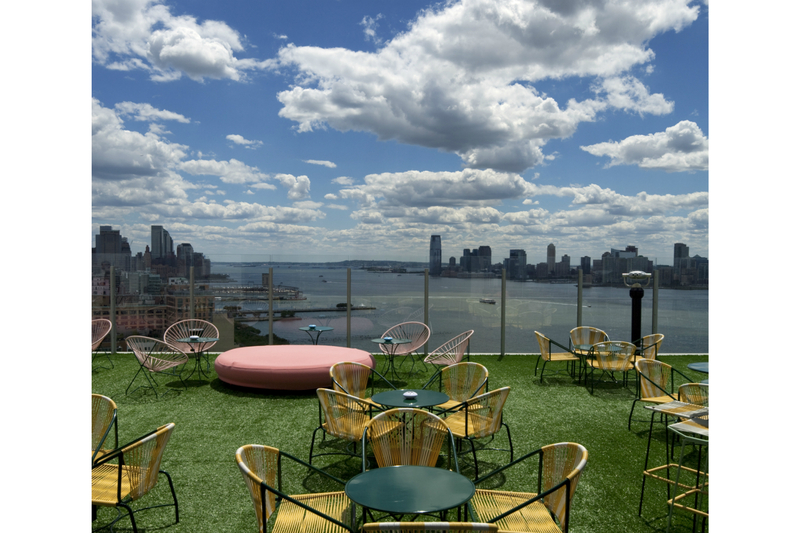 If you're feeling fancy, the Standard's grassy rooftop has sweeping views of the Hudson — plus a swimming pool for a more literal "drinking by the water." Get there early or risk not getting in. It opens at 4 p.m. weekdays, 2 p.m. weekends. This famed City Island eatery opened in 1923 and lets diners feast on fresh seafood, sushi and frozen tropical drinks while enjoying beautiful views of the sunset. Patrons who can't get enough seafood can order the Nantucket Chiller Seafood Tower, consisting of two whole lobsters, shrimp cocktail, clams, fresh oysters, mussels, scungilli and calamari salad. A beer in one hand and a king crab in the other is standard at Red Hook's Brooklyn Crab, one of the neighborhood's most popular and recognizable bars. 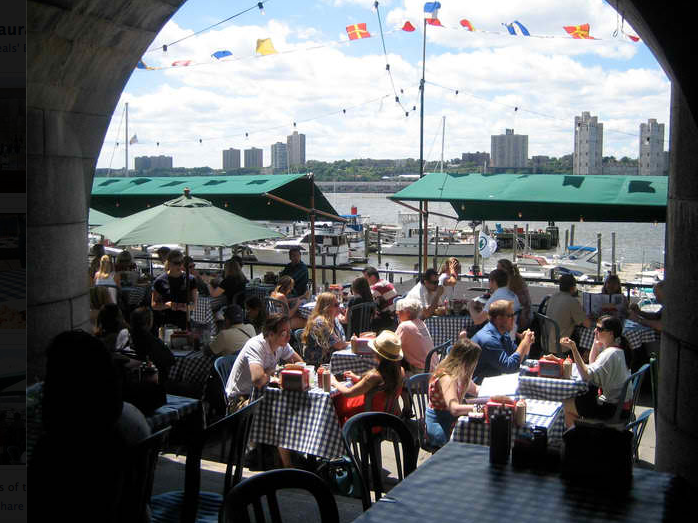 Found right by the neighborhood's Fairway Market, the Crab's open drinking and dining area is the perfect place to take in Red Hook's waterfront. Brooklyn Crab is open seven days a week with a Monday and Tuesday happy hour deal of $1 oysters and $3 Narragansett draft beers. 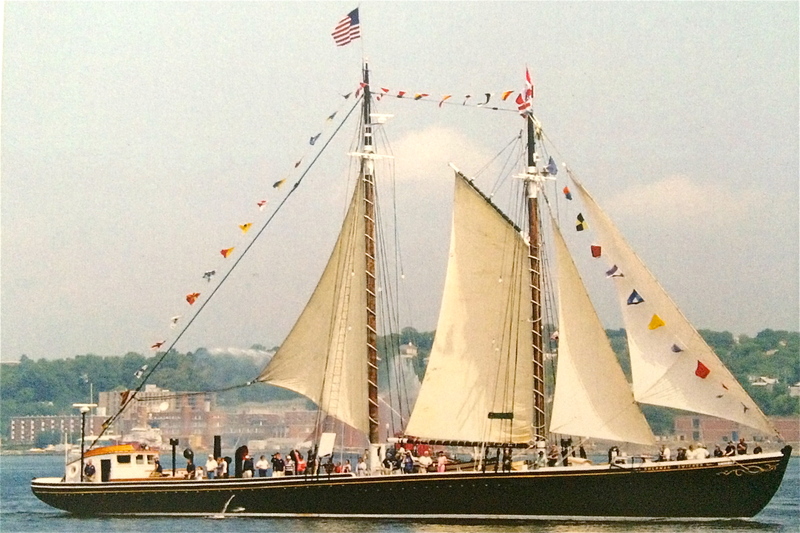 The Frying Pan is a historic floating lighthouse on the Hudson. A pitcher of white sangria is $37. You can snack on Old Bay garlic fries or order lunch or dinner. This spot can get packed on the weekends, so try it on a Monday or Tuesday evening — it's a great place to be right after sunset. The takeaway window at Pier i Cafe offers your standard burgers and hot dogs in addition to healthier options like salads and hummus platters. 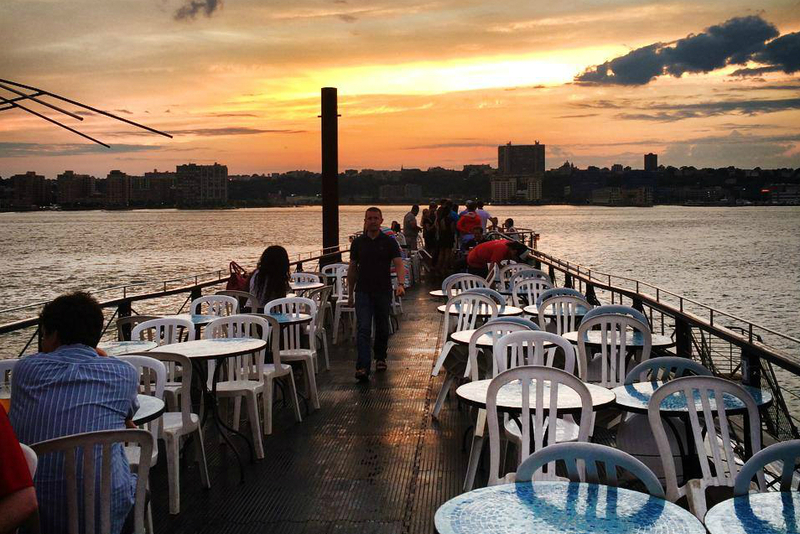 It serves beer and wine and there are usually enough free tables so that you can get a seat with your friends and watch the sun set over the Hudson. The vibe is laid back and family-friendly, but nice enough for a date. A lunch scene at the Boat Basin Cafe. Photo Courtesy of the Boat Basin Cafe. The seating overlooking the boat basin at this cafe goes fast and there's often a wait, but the opportunity to feel miles away from work by watching boats gently swaying on a summer's evening make it worth it. There's also a cavernous interior with a sports bar vibe and large screen TVs to match. An evening at the Watermark Bar. Photo Courtesy of Watermark Bar. Glass-enclosed Watermark Bar serves up a selection of beer, wine and specialty cocktails with great views of the Brooklyn Bridge on the East River waterfront. The eatery, which has outdoor seating on Pier 15, also cooks up a menu of burgers, sandwiches and “snacks” like fried oysters and guacamole. The sprawling historic building was recently renovated into a huge bar and restaurant that specializes in craft beer, cocktails and seafood. You'll find great views of the Statue of Liberty and the Hudson River, especially while enjoying the Pier's ample outdoor seating. The ambiance is lovely on this historic ship. The cocktails are expert, but pricey (about $15) and you can sample a quality selection of oysters and other small plates on this cozy boat docked in the Hudson. Twilight at Swan Dive. Photo Credit: Quyn Duong. 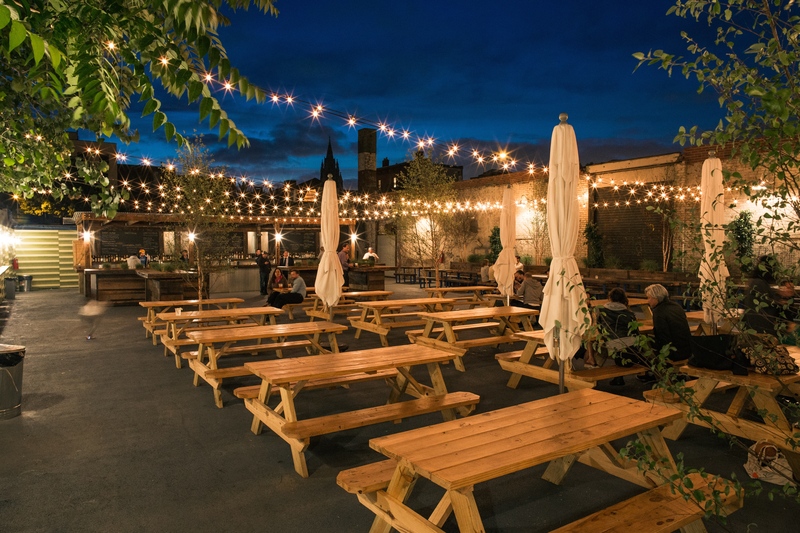 Brand new this summer, this temporary restaurant and bar will serve barbecue, local beers and spirits on the banks of the Gowanus Canal until Oct. 31. Organizers describe the venue as "the first waterfront food and beverage destination on the canal." 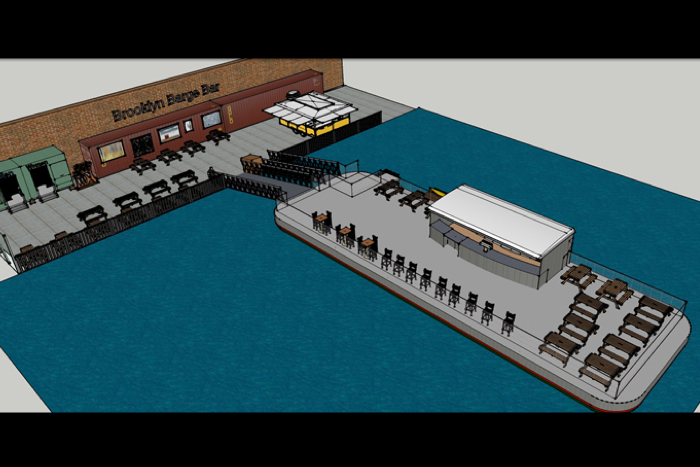 A rendering of the plans for Barge Bar courtesy of Brooklyn Barge Bar/Will Drawbridge. Keep an eye out for the opening of Barge Bar this summer. Owner Will Drawbridge — yes, his real name — said he hopes the seasonal spot will be open before the end of June. Enjoy great views of the Queensboro Bridge and Manhattan skyline at this casual bar in Long Island City. Grab at seat at one of the many picnic tables near the waterfront and chow down on a simple menu of grilled fare, including hamburgers, hot dogs and sausages. Dramatic Skies at LIC Landing. Photo Courtesy of LIC Landing. 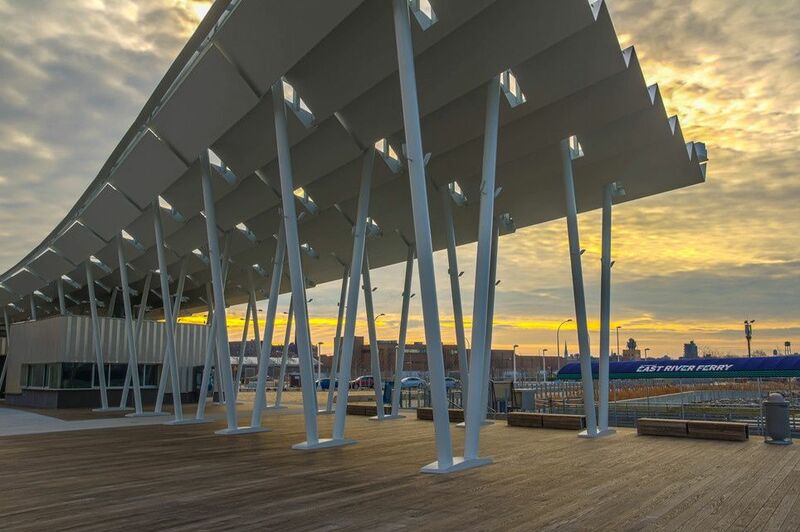 Check out this concession stand in Hunters Point South Park, which has one of the best waterfront views in Long Island City. Run by the same owners as eco-friendly cafe Coffeed, LIC Landing can get crowded on weekends when the weather is nice, but seating is plentiful. The menu includes wine, beer, coffee and food like sandwiches and burgers. The newly renovated Marina Cafe offers a glass enclosed dining room where you can check out Great Kills Harbor while chowing down on some food. The spot also has an outdoor Tiki Bar on the dock. The South Fin Grill, located on the boardwalk in South Beach, has an indoor dining room where you can grab some seafood and The Blu Lounge where you can sip cocktails while checking out the view of the Verrazano Bridge.